As people always talk about skippers in match racing, people tend to overrate these guys. You always hear of Russell Coutts' and Peter Gilmours, but hardly from their team. The fact is that match racing is a complete team game, and a good skipper is just a small bit of the big picture. Surely the skipper has a special role, as he's the one who assembles the team, and who makes the decisions while racing. But from a sailing point of view, it is equally important that the skipper drives the boat smoothly, or makes a nice pre-start move, and that the bowman sets the pole exactly at the right time, or the trimmer gives the exact right shape to the sails as required by the conditions. Sailing with quite a few different people by now, I came to realize that crew's tend to feel like they are secondary to the success and that it's the skipper that counts. This feeling is especially common with people who skippered themselves before. This is exactly the wrong attitude in a winning team. There, each member of the team knows that their performance is essential for winning. It doesn't matter if your hand is on the tiller, or on the winch arm, it is how each of these hands work together in harmony! As in the perfect rubbery, the prize should be shared among all members of the team. 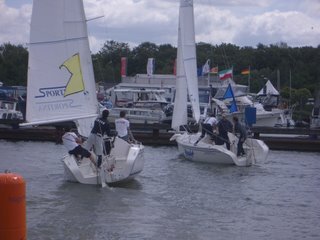 Although media's attention might be on the skipper and although the rankings by ISAF features only the skipper, team members should be able to claim a victory (or whatever position they achieved) as their own. Skippers on the other hand should always remember that although in the limelight, their name would mean nothing without the teammembers. I think it is a fitting way to finish this post by celebrating the entry of my name in the top 100 with all those who have sailed with me so far on the match racing circuit: Christian Sprecher, Lukas Ziltener, Alp Alpagut, Kaya Dinar, Arda Baykal, Onursal Soyer, Cagatay Soyer, Oguz Ayan, Anna Michelazzi, Stefano Michelazzi, Anette Soyer. THANK YOU!